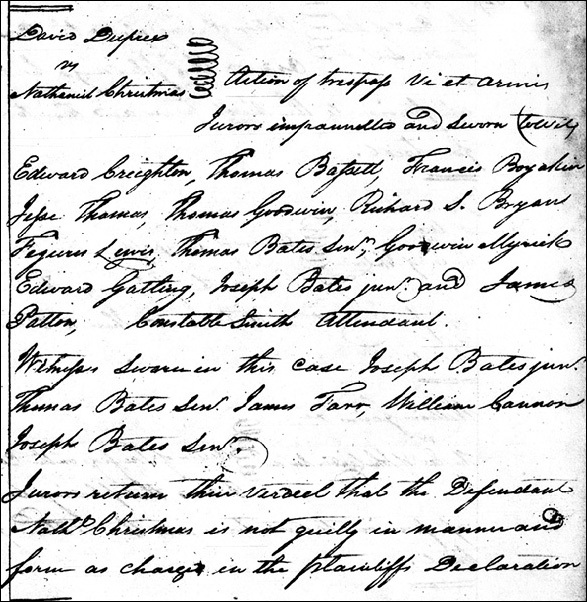 In the Mississippi Territory, in 1817, a jury of 12 men tried and true returned a verdict of not guilty against Nathaniel Christmas. And the “manner and form as charged in the … Declaration”? 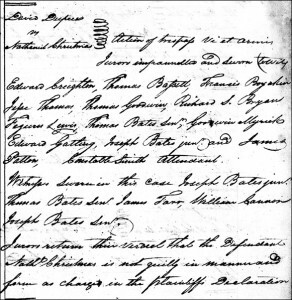 Does it make you feel any better that The Legal Genealogist had to look that up too? I mean, seriously, I went to law school in the 20th century. They didn’t teach legal Latin then! Okay! Now we get it, right? Um… what’s meant by “force and arms”? So now we’re all clear, right? Until we realize that, well, there are different degrees of force, and arms when used in “force and arms” doesn’t always mean a gun or a knife or a club, and exactly what’s meant in a court document like this is going to vary with the circumstances. Oy. It couldn’t be easy, could it? So let’s break down our Mississippi case. In order words, something as basic as, say, riding a horse into another person’s garden and damaging the crops is a trespass. And by adding the “vi et armis” part, we’re saying there were weapons involved, right? So this is a criminal case? No. By definition, trespass vi et armis was “a common-law action for damages for any injury committed by the defendant with direct and immediate force or violence against the plaintiff or his property.”9 Tearing down a fence on your neighbor’s property would be a trespass vi et armis. Going onto his land and cutting down a tree. Riding down those plants in the garden. Moreover, an action for damages is always a civil case. Person A suing person B for money. You don’t collect damages in a criminal case. Trespass vi et armis. A — pardon the phrase — garden variety civil suit for property damage. So if I’m arguing with someone while holding a feather duster and wave said feather in anger it would technically be force and arms?